Samsung Group seems to have all sorts of new and innovative electronic devices planned for launch in this upcoming year. One of the tech industry conglomerate’s newest products that it plans to reveal at the CES 2015 is its new all-in-one curved screen pc. This latest Samsung PC invention is being called the Ativ One 7 Curved. This ground-breaking new desktop PC features a curved display monitor, and Samsung claims that this Ativ One 7 is the very first all-in-one PC to have the famed curved display. It seems pretty apparent that Samsung has all but dominated the usage of the famous curved screen feature. Throughout the most recent couple of years, the company has added the feature to some of its recent smartphone designs and even a select few of its HDTVs. And then a few months ago, Samsung released a 27-inch curved monitor for desktop computers. The new Ativ One 7 Curved includes that curved monitor and also has a whole PC built around it. It is a 27-inch monitor and has a 1080p HD resolution. The PC itself is running an Intel Core i5 processor, a TB hard disk drive, 8GB of RAM , and the operating system is Windows 8.1 64-bit version. A few other added attributes include Dolby Sound Effects, a 1080p HD webcam, HDMI input/output, and APT-X lossless audio transmission technology which is a technology that enhances sound from its dual 10-watt speakers. Samsung smartphone users can use the Samsung company’s patented SideSync 3.0 software to make phone calls, and they can also receive and view their text messages on the computer’s curved screen. The Ativ One 7’s curvy monitor design helps to lessen screen glare and is more immersive than a normal pc monitor. 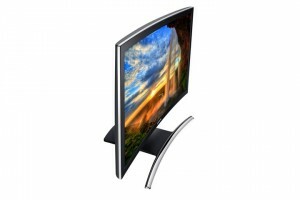 When the new Samsung curved PC is finally released onto the market, it will have a selling price of $1299.99. The company is planning the Ativ One 7 Curved’s initial launch in the first quarter of 2015.